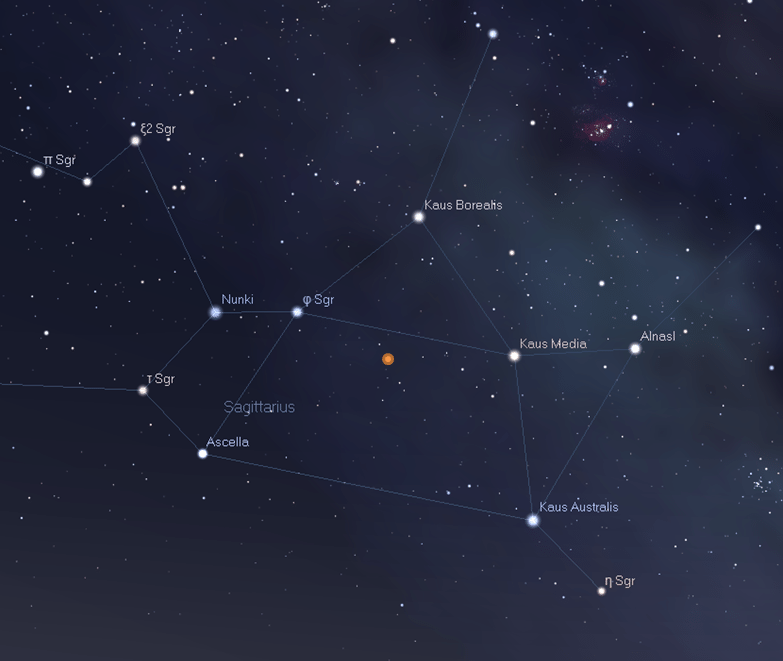 If you look at the constellation of Sagittarius (also known as the teapot) in the night sky just before dawn, you might notice an additional star toward the upper middle. It’s currently a 4th magnitude star, which is dim but visible with the naked eye under dark skies. It is the first naked eye nova we’ve had in a while. A nova is similar to a supernova, but not quite as powerful. It is produced by a white dwarf orbiting a red giant, where material from the red giant is captured by the white dwarf. When a supernova is triggered the entire white dwarf is ripped apart in a catastrophic explosion. With a nova, the hydrogen and helium captured from the red dwarf compresses on the surface of the white dwarf. The heat and pressure from this gravitational compression triggers a fusion reaction of the material. The result is a thermonuclear explosion that is not intense enough to destroy the star, but still produces a massive brightening of the star. Because the white dwarf is not destroyed by the nova, it is possible for the same star to go nova multiple times. Perhaps the most famous example of such a repeating nova is RS Ophiuchi, which has erupted six times since 1898. There are about 10 observed novae in our galaxy every year, but it is unusual for one to be bright enough to see with the naked eye or small telescope. So if you ever have the chance to look at this new cosmic explosion, it’s worth checking out. I’ve read that Type Ia Supernovae occur in a similar situation, where a white dwarf accumulates material from a companion star, and when the mass of the white dwarf exceeds 1.4 solar masses, it goes supernova. If a thermonuclear explosion is triggered causing a nova (before it can reach the critical mass), how does a white dwarf manage to reach the 1.4 solar mass limit to go supernova?